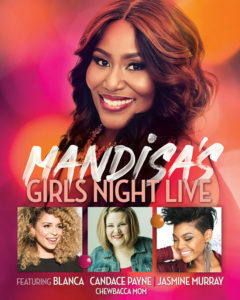 GRAMMY® winner Mandisa is inviting her longtime friends Blanca, Jasmine Murray and Candace Payne (author, speaker, viral sensation “Chewbacca Mom”) for “Girls Night Live,” an extraordinary evening aimed at strengthening female community. Envisioned to be a night of women encouraging women about matters that affect women, “Girls Night Live Tour” will include music, humor, worship and prayer. Noted for her vulnerability, the night will end with Mandisa and her friends joining the audience for a personal, encouraging “Girl Chat” and time of ministry. Mandisa’s desire is that each night will be different than the night before. With the added element of “Girl Chat,” the audience will have the opportunity to shape the conversation. “My friends and I hope to create a safe atmosphere where the ladies will feel comfortable getting real, and discussing the topics that affect us as women, and the timely challenges we face,” said Mandisa. This entry was posted in Christian Contemporary, Reviews and tagged Girls Night Live, Mandisa by Kris Patrick. Bookmark the permalink.